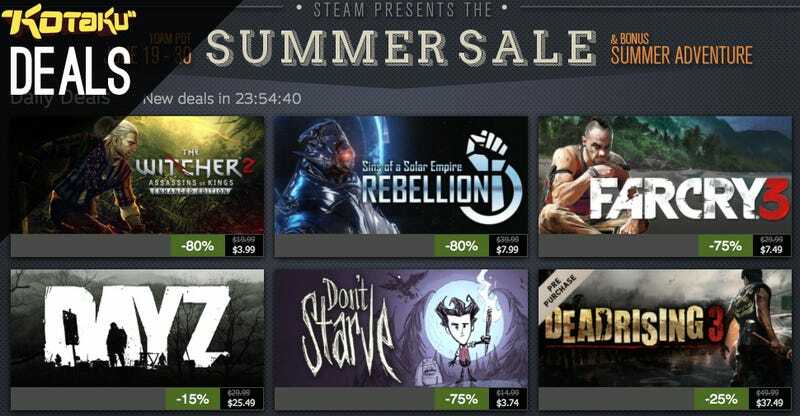 If countless gamers are holding out for the Steam Summer Sale to stock up on games, then what we're really looking for from it are unprecedented prices. That wasn't the case last year, so let's take a look at 2014's offerings. As always, you are best served holding out for the flash sales that cycle every 8 hours. Looking at the front page, $4 for Don't Starve and $7 for Far Cry 3 are standard deal pricing, as are most of the prices in that set of 9. However, you obviously can't go wrong with The Witcher 2: Enhanced Edition for 4 bucks, and we love seeing pre-order discounts like $37 for Dead Rising 3 on here. Check out Kotaku Deals every day at 12:45pm ET for the best deals in gaming, or join us for Kinja Deals every morning to get all the best deals on the Internet in one place. There are a ton of great pre-order deals happening at the moment, so let's round them up. pre-order Sunset Overdrive from Microsoft to grab a $10 Xbox credit. The Far Cry 4 Collector's Edition is also up for pre-order now.